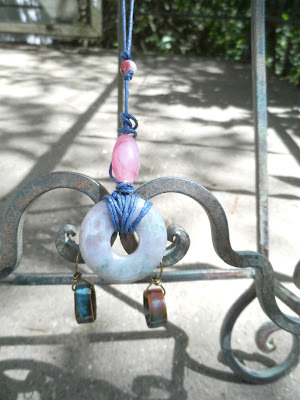 This week, I delivered to one of my best customers, a necklace and earrings made to match. Notice, I did not say "matching set" because when I made the necklace, I had no interest in making "matching" earrings. But...when one of your best customers asks you for matching earrings, you don't turn to her and say, "Why, you already have several pairs that would look splendid with this necklace." No, you make the earrings. As a matter of fact, you make two pairs of earrings, so she can have a choice. So, the customer is (nearly) always right. Right? But I am not a "matchy matchy" type. I don't like to make sets, although I do, occasionally, because people ask for them. I will suggest earrings that I think would look good with a necklace or bracelet but that's a whole different thing for me. The pendant is something I "bought" from myself, I liked it, and took it out of my items for sale. 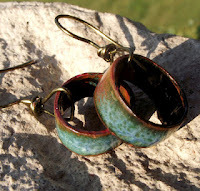 The earrings, are from MaryAnn Carroll, copper tubing with heat enameling. They certainly were not made to match. Yet they reflect color, shape, and I think a certain playfulness that make them look good together. What about you? Do you make or buy sets? Do you meticulously match earrings, necklace, bracelet, and ring? How about metals? Gold always with gold, silver with silver? If you wear colorful jewelry, do the earrings have to match the top? If you make jewelry, do you make a lot of sets, or do you let nature take its course, and let the customer put it all together? This is a good question :-) I don't really have any actual matching jewelry, but I do worry about this idea. I have to wear a lanyard for work, and I only have a few. I made one that is mostly black, white, and clear, so I could wear it with pretty much any shirt and pick out earrings to go with the shirt. I usually make matching sets to sell and to wear. I am rethinking selling in sets as last year quite a few people wanted to buy the earrings and not the necklace. So this year I am thinking of pricing them separately. Maybe offering a discount to buy the set, haven't decided on it yet. One of the things I am going to be asking about on my blog.